Interior designing trends, like trends in many other areas, come and go with the passing of the year. Regardless of this, it pays to keep apprised of the changing trends, as it often occurs that there are things in some of these trends that are worthy of notice. Here are 9 of the biggest trending interior design styles, quirks, and schemes. Wood paneling or furniture is and has always been a classic staple of home design. Everyone wants to be able to have a good hardwood floor, or a good-looking credenza. Nowadays, however, it's becoming far more trendy to have some of the darker-toned or stained woods - like mahogany - to create a warmer feel. Ah, yes. Everyone loves a good metallic-themed decorating style. And, this year, it looks like brass is getting a go. And, frankly, it's about time. Brass ornaments, like lampstands, give a room a nice, old-world feel. Check out my article on how you can incorporate touches of brass (big and small) into your home decor. One of the tricky things about painting one's room has always been matching the correct type of color that one desires. However, if you want to simply circumvent that, it's always possible to go with a good black-and-white theme. This color scheme lends a classy touch to a living room just as much as to a kitchen. This monochrome room is clean and simple. Now, let's say that you've chosen to go with dark woods and maybe even dabbled in some monochrome in your room. The perfect way to highlight this arrangement might be with something like a bean bag chair in a green tone. That way, you can keep the simplicity while adding a splash of personality. This lime green is not too bright and definitely lends a nice fresh, green color to the room. 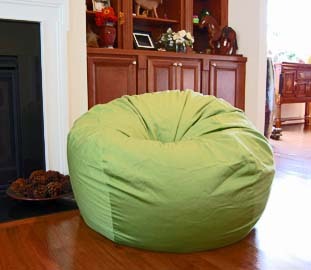 This lime green organic bean bag chair accents the darker wood floors and furniture. Bah! Who needs exquisitely carved chandeliers or handcrafted wooden when you can have lights made out of pipes or other metallic parts. This can nicely complement an angular living room arrangement, as well as stark or simple color schemes. These steel industrial lights are perfect in this simple kitchen. OK, let's face it: not everybody will want to go for the black and white color scheme. So, if you're going to go for a multi-colored wall combination, try something in lighter pastel colors, like yellow or robin's egg blue. It'll give the room a light, airy feel. This is also a great opportunity to incorporate a bean bag chair in a pastel color. And since it's so portable, it's so easy to throw in a room to quickly add pastels to the color palette. 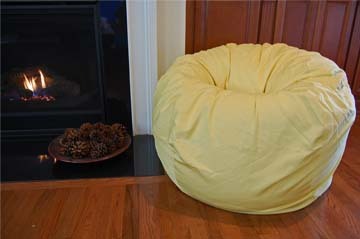 A yellow bean bag brings a bright, pastel touch to room without being too childish. So, let's say that you want to give the wall of your living room a palatial feel to it (and, if we're being candid, most people want to do this). One of the best ways to do this is to give the walls a trellised or embroidered design. You can even emulate a tapestry, if you like. Yes, yes, we know that the sleek, straight-edged kitchen was all the rage a little bit ago. However, nowadays, kitchens using organic, smooth-toned materials are coming into style, along with mosaic-style counter tops and casual seating. The built-in bench creates such a great homey, comfortable kitchen eating space. If you want to go against what is ordinarily the grain of the living room, you might try converting your deck or your porch into your new living room. Of course, you might want to put up screens, to keep away the pesky insects during the summer. If you have an outdoor area that is covered, you have another great opportunity to add bean bag chairs that have outdoor fabric covers, like Ahh! 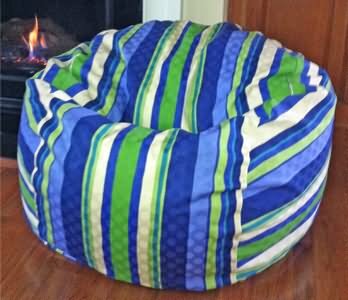 Products' Marina Stripe outdoor bean bag. Just place them strategically around a fire pit, or among other outdoor furniture to being the homey indoors outside! This covered space extends the home beyond the interior walls and into the outdoors. This Ahh! Products' Marina Stripes cover is a Robert Allen outdoor fabric. Have you used any of these trending design ideas yet? Please let me know and by all means, send in pictures! Special thanks to my friend Steve for co-writing this 2013 home decor trends blog post! I'll be expanding more on these trends in my upcoming posts!